The Tethera from Altberg are a traditional looking, full leather boot from a brand with a strong walking boot heritage. A key feature in this 2011 women's Tethera is five width fittings across all sizes - something which I think at the moment is unique to Altberg. Certainly this feature will appeal if like me you often encounter problems with fit. I was wearing my usual walking boot size - but in a 'Wide' fitting. I've been wearing these boots throughout the UK summer months for a variety of walking including some (wet!) lower level walks in Cheshire, a week long walking holiday on the Sussex Downs and some mountain walks in Snowdonia. The Tethera are certainly very comfortable. They are relatively light (for full leather boots) and have a really generous amount of padding around the ankle cuff and tongue. In fact, this padding extends a little down the back of the boot to provide additional protection around the achilles - which I noticed particularly when going downhill. The fit was good - there wasn't as much room at the front as I notice on other walking boots of the same size. This hasn't been a problem at all - possibly because the slightly narrower heel in the Tethera did keep my foot from slipping forward at all. The lacing system is excellent - it's extremely easy to get the right level of tightness at the front of the foot and around the ankle. There's pretty minimal stitching on the upper so virtually no points where water is likely enter. The Sympatex lining has so far provided excellent water-proofing without massively over-heating my feet in the (rare) warm weather I've encountered so far. There's a full rubber rand around the whole of the boot - so far there is only minimal scuffing of the leather. The classically cleated Vibram Tsavo sole completes what is a really very impressive boot. 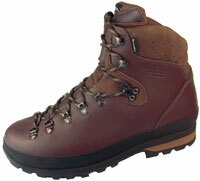 Altberg's Tethera is a well specified, reliable 3-4 season walking boot. Certainly a worthwhile investment if you're a regular, all-year hill walker particularly if you can benefit from the additional width fittings.